I partnered with Scholastic to share this giveaway. Read the epic novels by Dav Pilkey before you see the movie! Captain Underpants: The First Epic Movie comes out on June 2. In stores now. Now that summer is here and the weather is beautiful we love to spend time outside reading books. 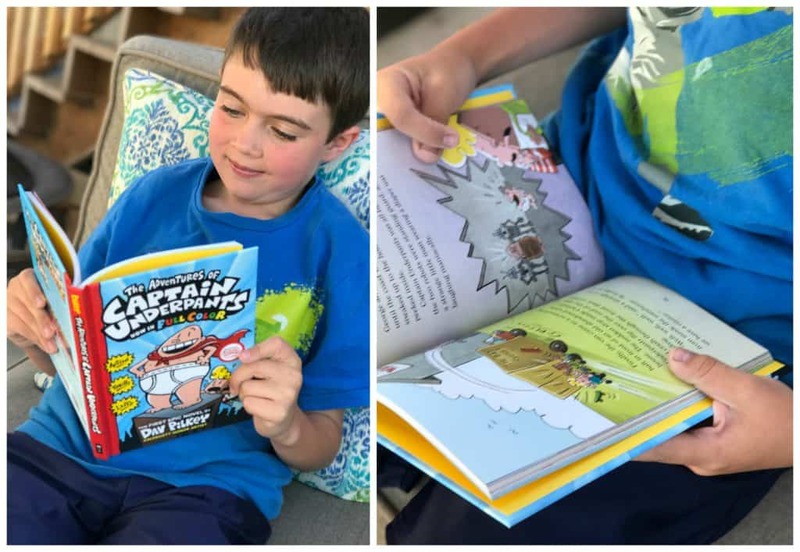 My kids have all loved the Captain Underpants series so my 8 year old was looking forward for a day of reading reading The Adventures of Captain Underpants book 1. These books always give him a good laugh and I love that they encourage reading. He had been counting down the days until the Captain Underpants: The First Epic Movie came out into theaters and wanted to catch up on his reading before seeing the movie. Your kids will love being able to read the epic novels by Dav Pilkey before seeing the movie, too. For more information visit PilkeyPower.Scholastic.com. You can also follow Scholastic on Facebook, Twitter, and Instagram. What better way to celebrate a fun book and a fun movie than with a great giveaway! !